Cover Title: "Deathstorm: T-Minus 3!" On the surface of the moon near the city of Attilan, Nova has been captured by the Inhumans and their ally, Star-Thief! The Inhumans tell Nova that his fate is to be judged by Attilan's ruling body, the Genetic Council. Nova is being charged with conspiracy to destroy Attilan. Star-Thief informs the young hero that a mysterious message warned them of Nova and Nova 0:0 arrival and intent. Nova convinces Star Thief that they have been lied to by an unknown enemy and that the approaching Deathstorm is their mutual threat. However, the Inhumans refuse to free their prisoner and decide to take him to the Genetic Council. Nova becomes angry and uses the Nova force to break free! Before an all-out war can begin, the leader of the Inhumans, Black Bolt intervenes! Black Bolt decides that Nova will have to face Deathstorm without the aid of the Inhumans. The Inhuman named Lockjaw teleports Nova and the Inhumans back to New York City. Meanwhile, in the headquarters of the mysterious Shadow Consortium, the Condor is receiving a special invitation. One of the Consortium's leaders, the Planner, wants Nova's foe to gather super-powered beings into a force capable of conquering the planet for the Consortium. The Planner is joined by his fellow leaders, Thera and Maxoff. The Condor finds the Consortium's alien technology and enforcement squad, Shatterforce, intriguing. He informs the Consortium that they will have their answer in two days. Back at the New Warriors' Crash Pad, Nova is consulting with his friends, Night Thrasher and Firestar. The two Warriors have been helping Nova track down information on Shatterforce. They discover Warhead was a bank robber who Nova had captured years ago. After escaping prison, he murdered a family and was later executed in the electric chair! Realizing the potential of the Shadow Consortium, Nova wonders if they may be responsible for Deathstorm. Night Thrasher calls Nova paranoid and the two almost begin fighting. Firestar quickly intervenes as they receive a message from Nick Fury. The leader of SHIELD tells the New Warriors the name and location of the Shadow Consortium. SHIELD just learned this information and Fury felt Nova deserved the chance to smash their operation. A short time later, the Warriors begin their assault on the Consortium's supply warehouse in New Jersey. After quickly knocking out the guards, Nova begins his full attack on the warehouse! Inside, he finds radioactive materials and a large number of armed criminals. The control room alerts the main base of the attack as a guard blasts Nova with a high energy weapon. The young hero plays possum while his helmet's radio tracks the signal's location. After getting a fix on the Consortium's headquarters, Nova quickly knocks out all of the remaining criminals. 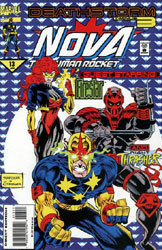 The Human Rocket returns to Night Thrasher and Firestar to find they have taken care of their own group of armed henchmen! Back at the Rider home, Rich is finished dinner with his parents and brother. After saying goodnight to their parents, the two brothers go to Robert's room. Rich reveals everything he knows about Nova 0:0 and Deathstorm to his brother. He also tells him that the New Warriors are going to attack the Shadow Consortium and he wanted to see his family just in case he didn't return. After receiving encouragement from his brother, Rich turns into Nova and leaves to join the Warriors. Robert begins working on a computer model of Deathstorm in order to help his brother. As he looks over his notes, Robert begins drawing over the 0:0 symbol on his notepad. The symbol begins to take the shape of an infinity sign but it goes mostly unnoticed by Rich's brother. Elsewhere, the Shadow Consortium has become frustrated over their efforts to eliminate Nova. The group funding the Consortium has decided to take over the operations due to the repeated failures. No longer will Nova be facing normal humans but now he must battle...the Aakon!